Thank you Liberty Mutual for honoring Coach Larry Kehres as the Liberty Mutual Coach of the year! Along with the hefty silver trophy for the coach, Liberty Mutual executives, Jerry and Glenn, brought good wishes and a pocketful of checks for charities in our community selected by Coach Kehres. 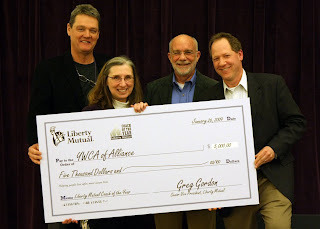 Thanks to the teaming of Liberty Mutual & the Coach, the YWCA received a BIG check for $5000. Cheering loudly in the audience was YW Board President Cheryl Paine. Touchdown for the home team! The YWCA is proud to sponsor the annual Alliance Middle School National Geographic Geography Bee. 24 students qualified through classroom tests to participate in the contest. Principal Ken Fay was on hand to cheer on the students and to welcome parents to the event. The format and questions (they were tough!) came directly from National Geographic. Barb Armitage, a YWCA Board member, took on the difficult role of reader again this year. The students did a great job showing a lot of poise and knowledge. The YWCA also sponsors the Geography Club that meets after school under the direction of teachers, Laura Stauffer and Ashley DeBolt. This year's winner and the 3rd place student are club members. 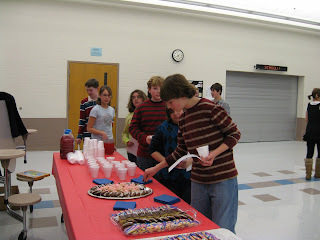 The evening ended with cookies and punch prepared by the YW kitchen. 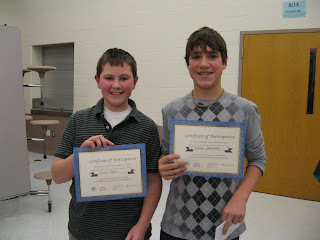 Congratulations to sixth grader Will Oesch, first runner-up, and to eight grader Nick Skidmore winner of the Bee. Both students were awarded certificates from National Geographic, savings bonds, and are eligible for a $1000 scholarship to further their education. The bonds and scholarship are provided by the YWCA and are made possible by the generosity of a YWCA member who wants to help young people to excel.